Dig out your winter jacket, mittens and bobble hat: there’s a cold front coming your way. 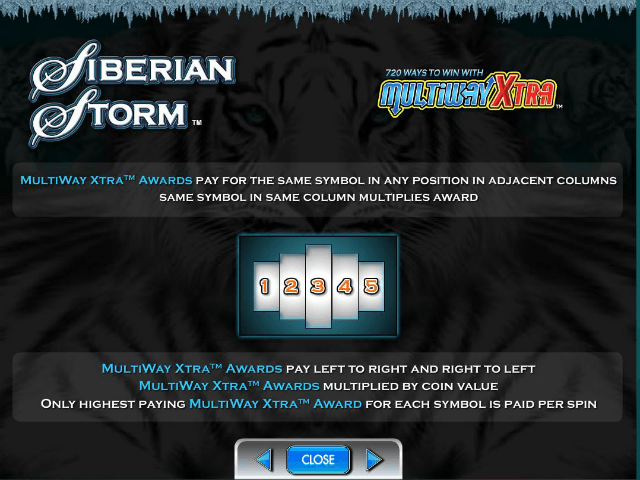 The Siberian Storm slot machine is a cool adventure from the team at IGT featuring patented MultiWay Xtra technology, which is as exciting as it sounds. In a nutshell, players have 720 ways to win with each and every spin of the reels. 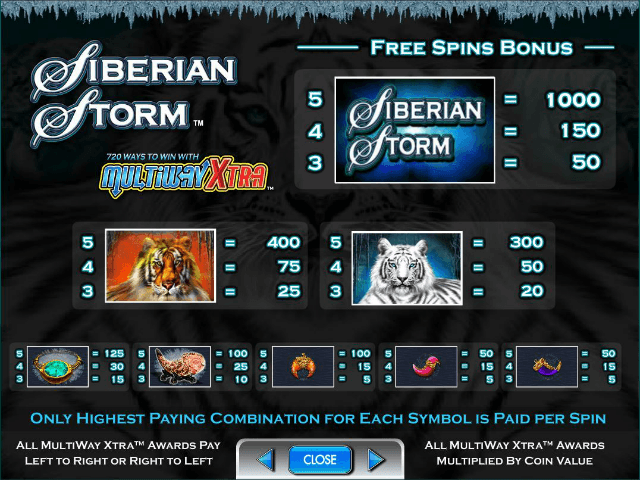 That would be enough goodness for most slot titles, but the Siberian Storm slot wants to reward gamers for their frostbite and frozen eyebrows. So, it has included a wild, a scatter and a free spins round as well. If that doesn’t warm your cockles, nothing will. And don’t forget the MultiWay Xtra feature. This pays out for matching combinations of three or more from left to right and right to left, so all spins are packed with potential. The 720 Ways to Win feature is set in stone, and this requires a payment of 50 coins for each turn of the reels. Players are free to edit their coin value as they see fit, with denominations from 1.00 to 50.00 available. There isn’t an autoplay or fast play function. 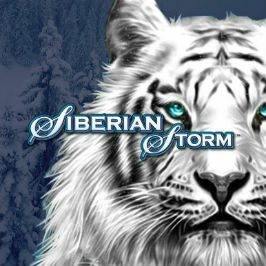 As if having 720 ways to win with every spin wasn’t enough, the good folk at IGT have incorporated some fun extras into the Siberian Storm online slot that can enhance your bankroll yet further. The first of these is the wild symbol, and this substitutes for all other game icons apart from the scatter, which we’ll look at in more detail shortly. The wild appears only on the middle trio of reels, but the addition of MultiWay Xtra means that these have added significance compared to standard slot games. 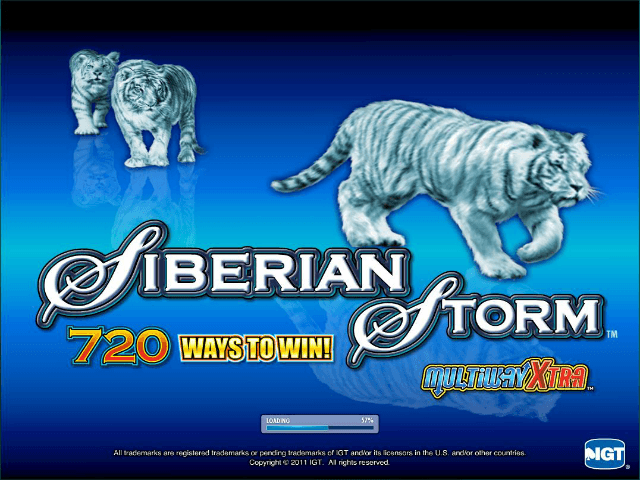 In short, wilds are invaluable in the Siberian Storm online slot. And then we have that scatter icon, which pays out two-times your total bet when three appear anywhere on your reels, ten-times for four and a cool 50-times for a full hand of five. That can add up to a rather handsome amount. But that’s not all. Five of the Eye of the Tiger pays out 50x your stake and triggers the free spins round. Eight freebies are awarded, although if multiple combinations of the symbol unlock the feature then a grand tally of some 96 free spins is available. This feature still incorporates the 720 Ways to Win technology, so the winnings available really will keep you warm on those long, cold nights. 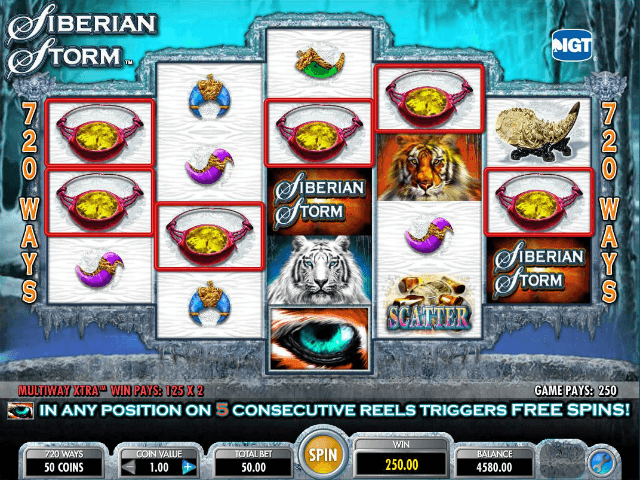 If you like Siberian Storm - You'll like these slots too!